©2013 R.L. Delight,"Solstice Turbulence", 6"x6" oil on copper. Today I broke away from the wave studies and brought a copper canvas to paint on. The clouds continue to be stunning and the weather unusual. In fact, the National Weather Service issued warnings of possible "cold core funnel clouds"! That boils down to epic clouds that tower over our tall mountains and unusual lighting conditions. 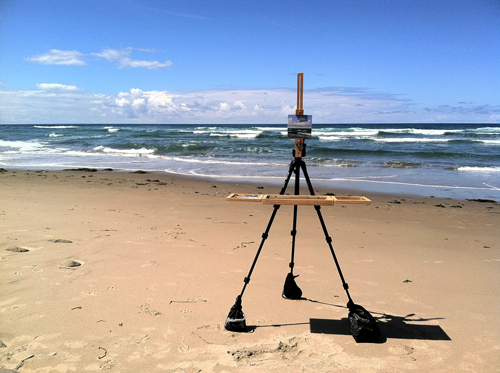 The weather on the beach is perfect for painting, not too windy, and warm! I haven't been rained on either. I am pushing myself a bit and am using some different approaches to painting than I have in the past. Whenever I try a new-to-me painting technique or approach, I hate it. Knowing that, I make myself try it several times before deciding if it is something I want to add to my tool box. So here, I am trying to use more paint and I am trying to think about my brush strokes. I actually am enjoying myself as it feels more like playing. One of the nice things about not having to worry about producing for a gallery is that I can take as much time as I want to experiment without the pressure of needing to have finished work for sale. The downside is, I don't have finished work for sale (or not very much)! I do need to start thinking about that so this piece will be going up for sale soon. I do want to let it sit for a couple of days to study it. I don't want to tweak the painting too much and lose the energy of the work. 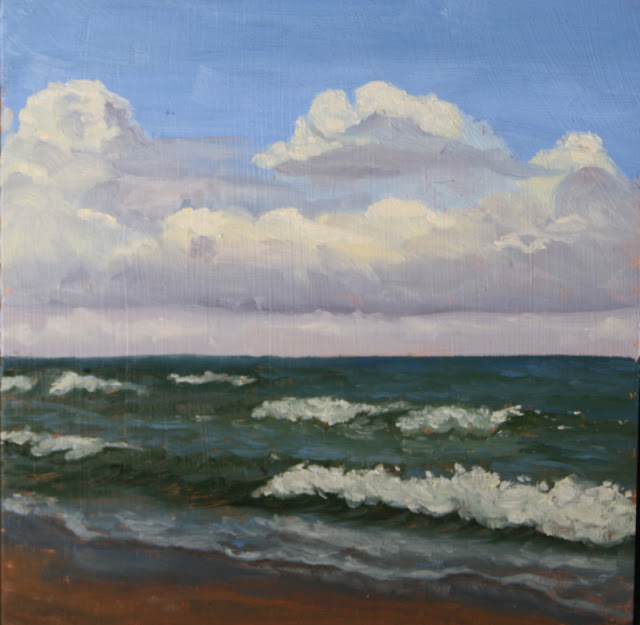 If the clouds continue to be so stunning, I will go out again to paint, maybe even another copper. I am off to walk my Twill dog and wrap up the day. I will leave you all with a picture from my "office" this morning. A view of my office on the Northern Oregon Coast. Wow, lovely painting...and lovely "office". The clouds must be something grand right now. Thank you Dana and Theresa! The epic clouds have moved on and our usual lovely gray cover has returned. No complaints though as I enjoy the soft light. Back to painting in the studio over the next couple of days while I work then another four days off to paint!